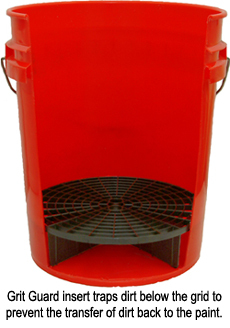 This is a very nice Wash Bucket, that includes a Grit Guard. It's at a very good price. It's light weight yet very sturdy, and looks good. It's very nice to work with! If you have a dark colored car and want to keep the scratches away this is a must have.It keeps your wash mitt out of the grime on the bottom of the bucket and ready to go grit free! ProsGrit Guard does a great job of keeping sponge above the bottom of the bucket. I got a clear bucket for my rinse, and red for the suds. This helps me to keep them straight. The grit guards fit perfectly snug. The depth of bucket allows for lots of water to really clear debris from sponge and ideal for any car, especially black. They seem durable and priced right. Nice bucket, that is kind of see through that has gallon line markers on the side for measurements which is cool.. The bottom of the bucket seems to be a little thin to me. That's my opinion.